Calvin Ryan earned a win in the Titans’ 6-3 upset victory over first-place La Cañada last Wednesday. The San Marino High School varsity baseball team extended its winning streak to four games, most recently defeating visiting Monrovia, 2-1, in a Rio Hondo League contest last Friday. 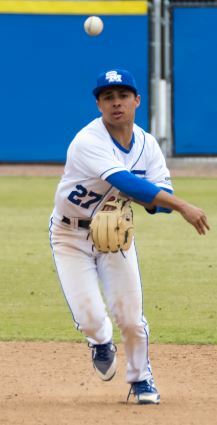 Two runs were enough for pitcher Noah Herrera, who tossed five innings and allowed one unearned run on four hits and three walks and struck out five. Kade Wentz relieved his teammate and allowed only one hit and walked one and struck out three in two innings of work to pick up the save. Dihlan Anvekar was 1-for-2 with a run batted in, and Jazz de Perio and Tommy Long each scored a run. Beau Hobbie had an RBI, Wentz hit a double and Sean Richardson collected two singles and stole a base. The Titans (5-7 overall record, 4-3 in league), who moved from fourth place to third last week with three league wins, hosted Brea Olinda in a nonleague game on Tuesday, April 2. San Marino will take a small break and return to action on Wednesday, April 10, against visiting South Pasadena at 3:30 p.m.
Sean Richardson singled twice and stole two bases during San Marino’s 2-1 victory over visiting Monrovia last week. Kade Wentz picked up a save against the Wildcats by tossing two scoreless innings. The senior reliever allowed only one hit and struck out three. The Titans scored four runs in the top of the sixth inning to defeat first-place host La Cañada, 6-3, in a Rio Hondo League game last Wednesday. San Marino’s victory was the biggest one of the season as it handed the Spartans, ranked No. 3 in CIF Southern Section Division 3, their first Rio Hondo League defeat so far. Dihlan Anvekar led the Titans’ offense going 2-for-3 with a double, a triple, a run and three RBIs, and Jazz de Perio was 2-for-3 with two runs. Maximilian Bradley finished 2-for-3 with a double, a run and one RBI, Wheeler Smith and Steven Barazza each scored a run, Sean Richardson drove in a run, and Tommy Long and Kade Wentz each singled. Barraza, de Perio, Bradley and Smith each stole a base. 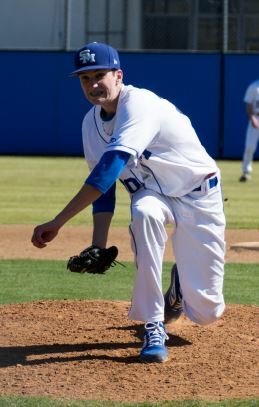 Calvin Ryan started on the mound and picked up the win, surrendering three runs (one earned) on 11 hits and two walks. Noah Herrera relieved his teammate and allowed only one hit and struck out one in 1 1/3 innings. Grant Spitzer was 2-for-2 with one run and an RBI in the Titans’ 8-4 victory over Temple City last week. 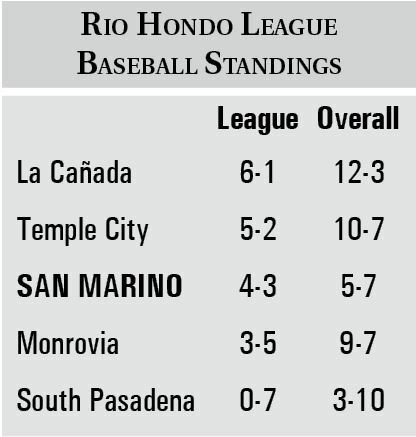 San Marino opened the week of play with an 8-4 victory at Temple City in a Rio Hondo League game on Tuesday, March 26. The Titans jumped out to a five-run lead in the opening frame, which was more than enough for them to come away with a win. Jazz de Perio was 3-for-4 with a double, a run and two RBIs, and Sean Richardson collected three hits and scored. Kade Wentz had two singles, two runs and one RBI, Grant Spitzer finished 2-for-2 with one run and one RBI, Maximilian Bradley was 2-for-4 with two RBIs and one run, Dihlan Anvekar drove in two runs, Tommy Long and Wheeler Smith each scored, and Noah Herrera singled. Zack Balbin picked up the win on the mound and allowed four runs (one earned) on four hits and three walks in a complete-game effort.